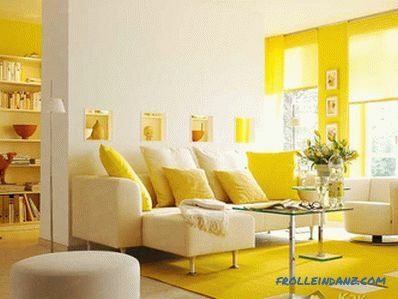 The color solutions in the interior can greatly influence the mood of the people who live in the house. Colors influence the perception of space, its illumination and harmony. Because it is very important to choose those colors that will have a positive impact on both the owners and the apartment itself. Before you pick colors in the interior, need to understand the so-called theory of light. 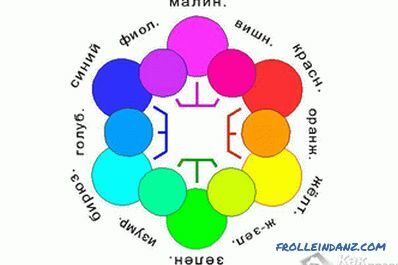 It says that there are primary and secondary colors, with intensive mixing of which results in the main color spectrum. When mixing these colors, six more new ones are born. 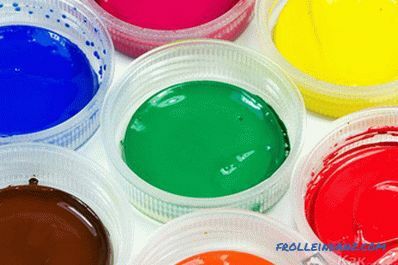 As a result, the main range of 12 colors is created. Then you can create within each of them an infinite number of shades. This is done by adding a certain amount of black or white to the base color. Each of the two groups has certain characteristics. So, warm colors warm and bring closer. Cold shades, on the contrary, alienate. Colors in the interior can not only create a certain mood. They are able to visually enlarge the space or compress it. In some apartments, the unfortunate color scheme creates a feeling of converging walls. This is a very unfavorable effect on the occupants of the room. If there is no comfort and harmony in the house, then, first of all, you should pay attention to the interior decoration. 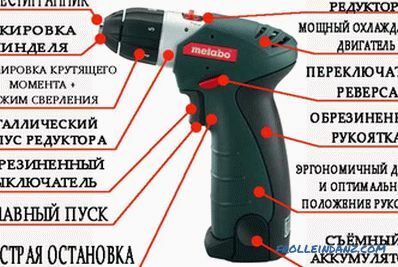 Repair can even serve as a kind of psychotherapy. No wonder psychologists advise every five years to change the situation. The color solution should not be too academic. Such rigor can create a strikingly boring look. It is better to approach the matter with fantasy, but do not forget the basic laws. Every room in the house needs a certain design. What is good in the bathroom or nursery may not be suitable for the living room. Therefore, we must carefully consider the finish of each room. Bedroom is the place where people, above all, rest. Therefore, there should not be anything sharp, too bright. It is noted that when there are too saturated bright colors in this room, people begin to suffer from insomnia and sleep disorders. And this is despite the fact that they do not even see the flowers most of the time. 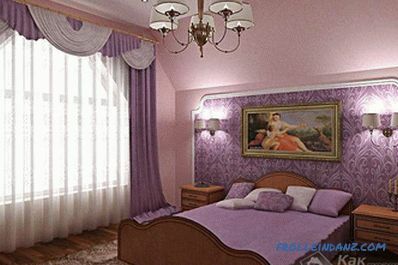 The combination of colors in the interior of the bedroom should be soft and harmonious. From the color palette is better to choose pastel shades. You can give preference to cold tones, for example, pale blue. This color calms and gives peace. Blue-gray color is also a good option. White color may also prevail in the bedroom, however, it is necessary to approach it with care so that the room does not become of hospital type. In addition to walls and doors, attention should also be paid to the colors of curtains, decorative ornaments and bedspreads. Curtains in the bedroom can be made very elegant. True, it should be avoided with too bright colors. 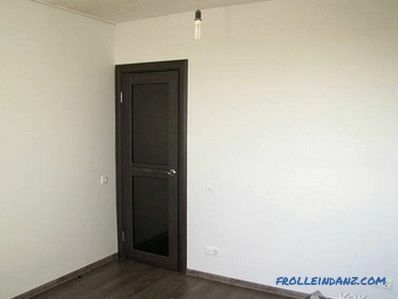 For example, the color red is strictly prohibited in this room. If there are drawings on the curtains, then it is better to purchase monotone pads and bedspreads for the bed. If the bedroom is small, then the curtains better to hang light, air. You can purchase curtains with small patterns. The color combination in the living room interior be the most diverse. Both bright accents and muted tones are appropriate here. Very important is the styling of the interior. Thus, a high-tech living room will have more cold tones, however, with the inclusion of a bright accent. 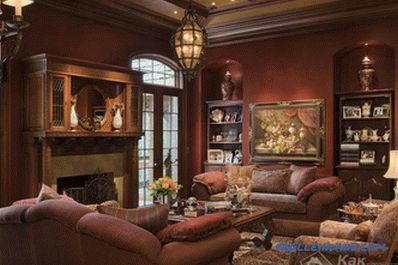 Empire style living room will delight you with a noble combination of gold and brown. Country in the interior will bring in the atmosphere of green and brown shades. The purpose of the living room is extremely important. Indeed, in small apartments they are often used as a bedroom. Therefore, we must take into account this moment before the repair. If someone spends hours of rest indoors, then it is better to make his design softer. For example, add cold soothing tones. If in the living room only guests are received, then saturated and deep colors with golden and silver accents are appropriate in the room. 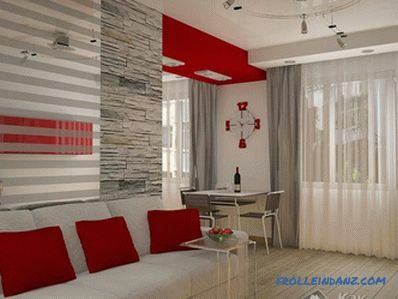 In small living rooms, the biggest mistake is to decorate the furniture in red or another flashy color. First, it narrows the space. It seems to inhabitants that the walls are crushing them. 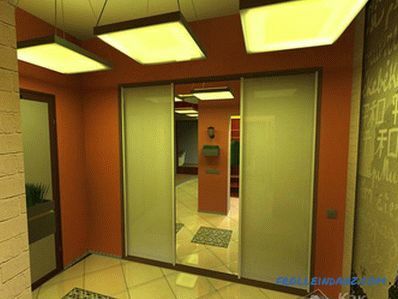 Secondly, bright colors significantly reduce the illumination of the premises. Even a professional designer will not give an unequivocal answer to the question of how to arrange this room.Most likely, it will provide several options for the choice of owners. When decorating the living room, you must consider its size. If it is small, it is better to make the walls, doors and ceiling of cold shades. This will visually expand the room. It also makes sense to add a few mirrors to the room. Saturated shades in the hallway A hallway is a room that meets a person at the entrance to an apartment. It is a kind of business card at home and sets the tone. 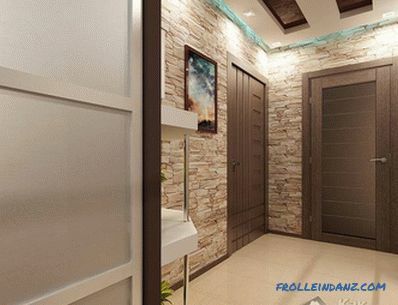 Therefore, the combination of colors in the interior of the hallway must be chosen carefully. On the one hand, this is a very important space at home. And on the other - there is a lot of dust. The hallway meets not only people. Through it passes street dust, dirt, moisture. Sometimes an umbrella or raincoat is shaken off. Therefore, white color in this place is contraindicated. The exception is washable materials, however, in this case they will require constant care. Screaming bright colors for the hallway won't work either. They will take all the light in the room. The best way to design the hallway - pastel colors. Brown shades are also well suited. Natural textures will look good. For example, you can trim the walls under stone or brick. 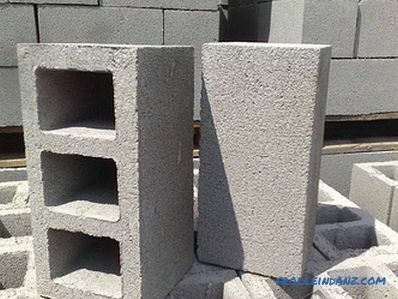 Both monophonic materials and materials with a pattern are suitable for a room. If the hallway is small, then you can use horizontal stripes on the finish to visually lengthen the room. If desired, the space can be revived with the help of plants. 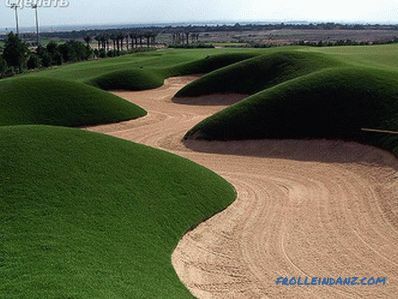 For this fit those types of vegetation that are unpretentious to the light and temperature. The combination of colors in the interior of the children's room should differ from the living room, but at the same time in harmony with the overall style of the apartment. Children like no other love bright colors. This is especially true of yellow, orange, green. Indoors you can make an incredibly colorful combination of colors. The main thing is to observe rationality. Images of your favorite cartoon characters and various funny characters will look great here. It is necessary, however, to remember that children in the nursery also sleep. It is advisable to demarcate the room so that they have a quiet place to rest. 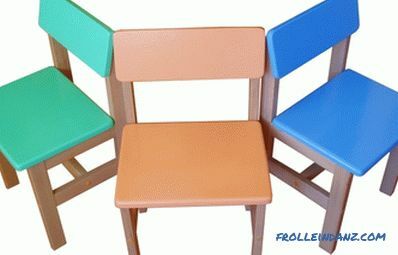 For older children, you can already arrange a nursery in more soothing colors. This will allow them to concentrate during the serious classes and fall asleep well. The furniture in the nursery is usually light. Curtains better made brighter. If the basic style in the apartment is high-tech, then in the room for children it is better to do something more "warm" and comfortable. From hi-tech items you can leave some interesting wardrobe. 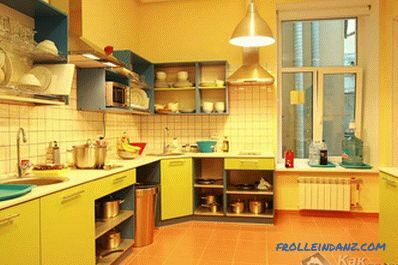 Kitchen is the place where reigns cleanliness and tidiness. The ideal style for the design of this room will be high-tech or modern. Modern is one of the most popular areas for decoration and furnishing of kitchen and dining rooms. 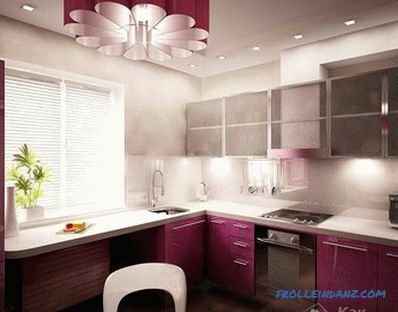 The combination of colors in the interior of the kitchen can be varied. 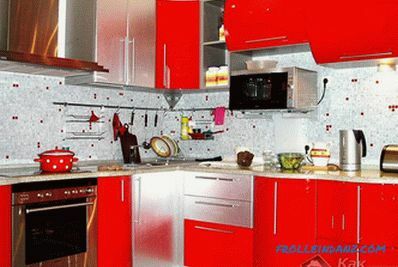 Here it is appropriate red (if the kitchen is not too small). Great for this room is a combination of white with some bright color. It is better to make the room in two colors. In this case, one will be the main, and the second - a contrast. You can create a more relaxed atmosphere in the kitchen. For this you need to make a decoration in pastel colors. Looks good in this room beige color. 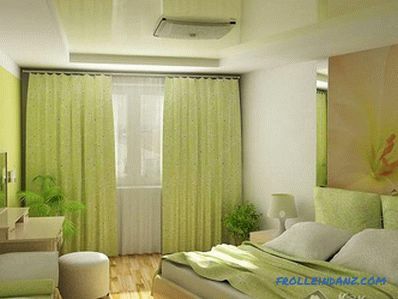 It is better to make curtains light and not too burdened by various details. This will create a feeling of spaciousness and comfort. Blue color in the kitchen, according to psychologists, reduces appetite. But red, on the contrary, causes a feeling of hunger. Therefore, those who are on a diet or, on the contrary, suffer from lack of appetite, we must take note of this. When creating a joint room of the kitchen and dining room, it is necessary to separate both parts using different finishes. 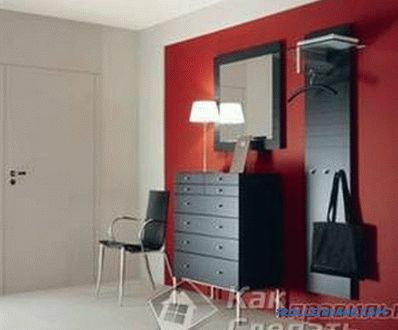 For example, you can arrange in different colors of the wall or floor. The same should be done when combining a living room with a kitchen. The two rooms should never be confused. Bright accents can play an interesting role. So, if the living room and kitchen are separated by a bar, then all the attention for some reason concentrates on the counter. To move the focus, it is necessary in one corner of the living room to put a home theater or other point of attention. Then the bar counter will immediately move into the background.